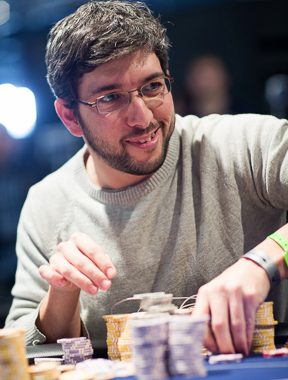 EPT Barcelona: Satellite Winner Leads The Main Event! Posted on Monday, August 25, 2014 by "T". In case you missed it, the Main Event of the 2014 European Poker Tour Barcelona kicked off last Thursday and saw a field of approximately 470 players battle it out for eight 75-minute levels of play. Believe it or not but over 1000 players showed up for Day 1B and made the tournament the biggest EPT event on European soil ever! After three day of intensive play there are now 102 of the original 1,496 players left in the field. 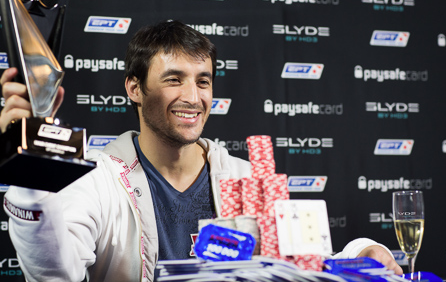 Read more » EPT Barcelona: Satellite Winner Leads The Main Event! 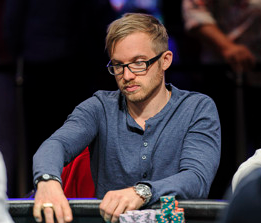 2014 WSOP Main Event: 27 Players Remain; Martin Jacobson Leads! Posted on Monday, July 14, 2014 by "T". Day 6 of the 2014 World Series of Poker Main Event began with 79 players, but after 11 hours of play only 27 remained. Swedish poker pro Martin Jacobson (perhaps best known for winning the 2014 EPT Vienna Main Event) will lead the remaining players into Day 7 with a stack of 22,335,000 - about 5.7 million more than Luis Velador (USA) in second place. According to WSOP's website, Jacobson got most of his chips in Level 27 when he won a big pot off Jason Johnson after he flopped a set with pocket 6's and got paid off by Johnson's pocket kings. The remaining players are now guaranteed a minimum payday of $286,900 with the chance of going all the way to the top prize of $10,000,000! We will be back with another brief report tomorrow afternoon. Stay tuned! Posted on Thursday, July 10, 2014 by "M". 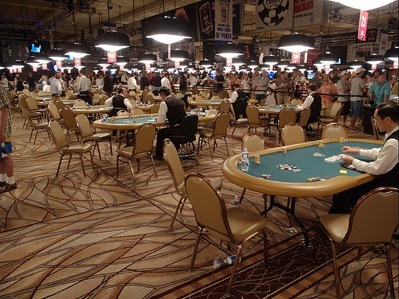 2,571 players sat down at the tables at the Rio All-Suit Hotel and Casino for Day 2C of the 2014 WSOP Main Event on Tuesda. 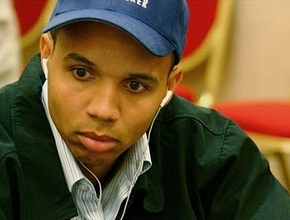 Once concluded after 10 hours of poker action, the legendary Phil Ivey was on top of the hill with a great stack of 505,000 chips which puts him on top of all fields! Some 1,400 players survived to Day 3C! The C-field had a lot of famous poker icons when it started. Some of which were eliminated during Day 2 including Phil Hellmuth, Gus Hansen, JC Tran, Gerard Pique, Andreas Hoivold, Dutch Boyd, Joe Hachem, Matt Salsberg and Daniel Colman. However, Daniel Negreanu made it and, although his stack is very shy (39,800), is ready for Day 3C! Posted on Wednesday, July 09, 2014 by "M". The survivors from Day 1 A & B continued their play in this year's main event on Tuesday. The two fields were seated in different rooms in the Rio All-Suite Hotel and Casino; survivors from Day 1a played in the Amazon Room while the B's were playing in the Brasilia and Pavilion rooms. Once Day 2 was concluded, approximately 700 players survived from both fields out of the +1,900 players that came through from Day 1. The chip leaders from Day 1, Martin Jacobson and Trey Luxemburger, could not hold on to the top through Day 2 although Jocobson played very well most of the day and finished 9th on 342,700 chips. 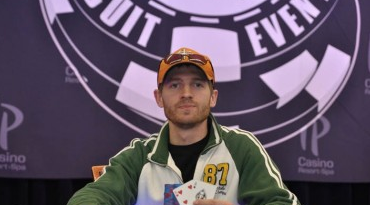 Luxemburger finished the day on 64th with a stack worth 186,800. The man that bagged the most after Day 2 is a relatively unknown player called Tim Stansifer who took over the lead with a chip count of 481,500. Posted on Monday, July 07, 2014 by "M". The 2014 WSOP's Main Event kicked off this weekend on Saturday. There were 771 players that sat down at the tables at the Rio for Day 1A of this year's $10,000,000 1st place guarantee event. 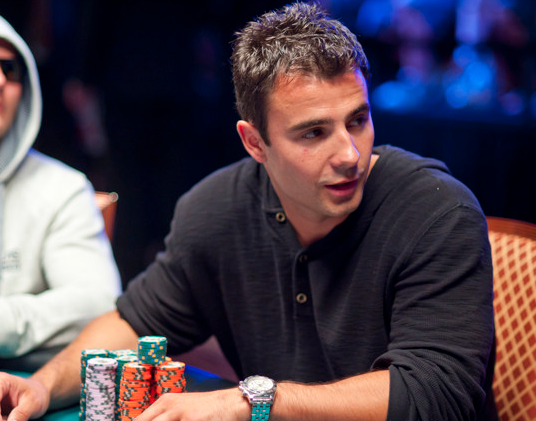 No other than the legendary 2005 main event winner Joe Hachem kicked off the event by announcing the classic "Shuffle up and Deal". Day 1A gathered some famous poker faces. No less than 5 previous gold bracelet winners were among the participants: Tom McEvoy, Johnny Chan, Chris Moneymaker, Greg Merson, and Ryan Riess. Once Day 1A concluded, the chip leader was Sweden's Martin Jacobson who bagged 200,100 chips for round 2. The young Swede has earned a total of $1,204,983 in WSOP winnings where the major part comes from finishing on 6th place in 2013's Event #47: One Drop High Rollers No-Limit Hold'em where he won $807,427. Posted on Wednesday, October 02, 2013 by "M". 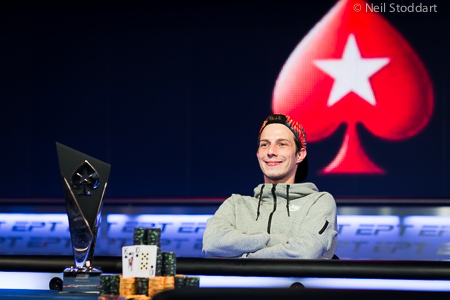 The WCOOP 2013 Main Event concluded with three German players in the top. With a buy-in of $5,200, 2,133 players and a total prize pool of $10,665,000.00, the germanic top three all earned +$1 million from the 26 hour main event battle. The winner of the event was a player called PlayinWasted who, according to several sources, is just 22 years old and used to play low cash stakes not longer than two years ago. PokerStars MicroMillions 5: $1,000,000 Guarantee Main Event This Sunday! Posted on Friday, July 26, 2013 by "T". Here's something to look forward to this weekend! PokerStars' MicroMillions 5 is concluding on Sunday with the $1,000,000 guarantee Main Event (at least $150,000 to the winner) and another 8 exciting events! It only costs $22 to enter the Main Event and take a shot at the massive prize pool. 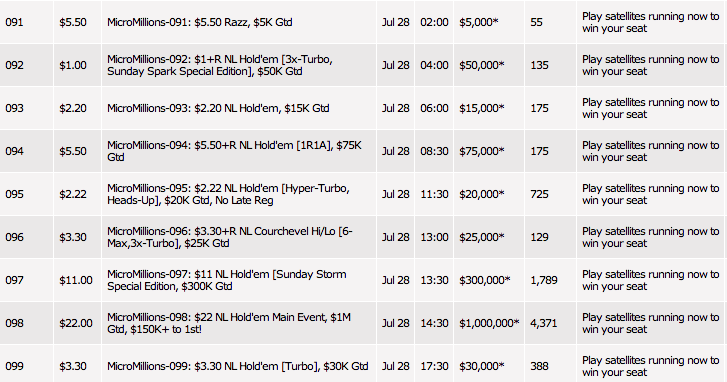 Also, there are Main Event satellites up and running around the clock for a fraction of the buy-in! Don't miss out on this chance of laying hands on $150,000! Good luck! Posted on Tuesday, July 16, 2013 by "M". The 2013 WSOP Main Event is now down to the last 9 remaining players who will re-unite to battle for the most prestigous poker prize in the world this November! This year's Main Event kicked off on July 6th with 6,352 players and a total prize pool of $59,708,800. Ten days later, only 9 remaining players are remaining to fight for the first prize of $8,359,531 + the Gold bracelet. Two out of the remaining players has won WSOP Gold Bracelets in the past. The chip leader JC Tran has two previous WSOP Gold Bracelets: 2008's $1,500 No Limit Hold'em event #49 and 2009's $2,500 Pot-Limit Omaha event #30. 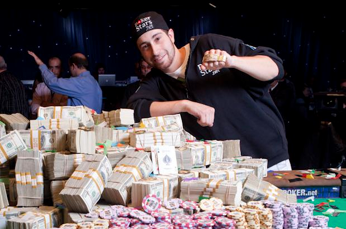 Amir Lehavot won the 2011 $10,000 Pot-Limit Hold'em Chamionship. Posted on Friday, July 12, 2013 by "T". The third day of the 2013 World Series of Poker Main Event came to a close a few moments ago. There are 666 player remaining with the top 648 places making the money, so it shouldn't take more than a few hours tomorrow before the money bubble bursts. 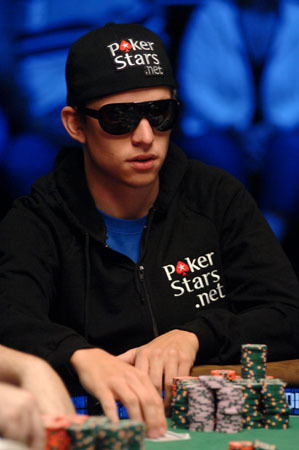 Now, the chip leader is Maxx Coleman from Derby, Kansas. Coleman will bring 1,071,500 chips to Day 4 of the tournament - the only player with over a million chips! 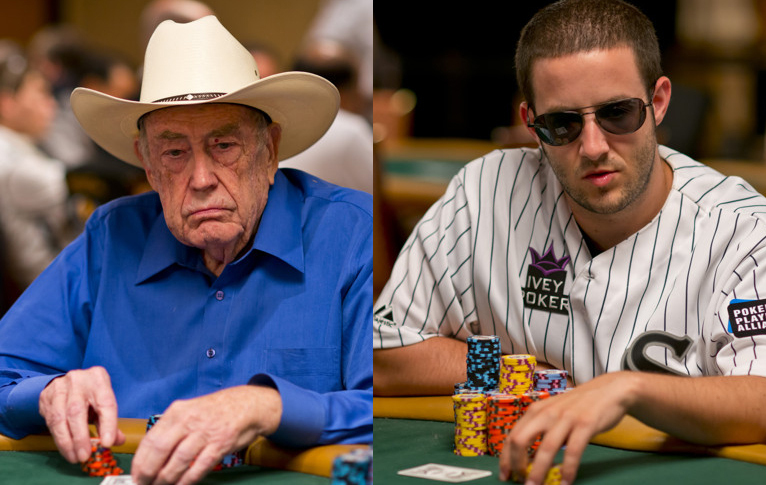 Doyle Brunson (left) and Greg Merson (right), two former champions of this event, are still in the tournament! The Godfather of Poker (10-time WSOP gold bracelet winner and two-time WSOP Main Event Champion) made it through Day 3 with 626,000 in chips, and Greg Merson, who won last year's Main Event, will bring 390,500 chips to the fourth day of the tournament! Apart from Merson and Brunson, there are many familiar faces (Luke Schwartz, Annette Obrestead, Marvin Rettenmaier - just to mention three with decent stacks) among the remaining squad of players. Day 4 will kick off at 12:00 p.m. Las Vegas time. Another five levels of poker are on the schedule and the money bubble will burst. It's set to be a thrilling day of poker! 2013 WSOP Main Event: Brunson and Merson Through To Day 3! Posted on Wednesday, July 10, 2013 by "T". Two of three Day 2 flights are in the books now and about 800 players are through to Day 3 of the 2013 World Series of Poker Main Event. The chip leader (at the moment - Day 2C still to be played) is Nick Schwarmann (413,600 chips) who overtook the lead from Jason DeWitt (ranked 2nd with 382,900) during the last level of Day 2. Schwarmann, from Orlando, Fla. has more than $400,000 in tournament earnings, including a 2nd place finish at this year's WSOP (Event #38: $2,500 NLH Four-Handed). Now, two of the biggest names to make it through Day 2 with plenty of chips were former main event champions Doyle Brunson and Greg Merson. Brunson (two-time main event winner) started Day 2 with 81,025 chips and finished the day with 224,000! Merson, the winner of the 2012 Main Event, started with 81,650 in chips and finished with 275,000 after a fantastic day at the tables. It will be interesting to follow Brunson and Merson during Day 3! We will be back with another WSOP Main Event update tomorrow, so stay tuned! Posted on Friday, May 24, 2013 by "T". 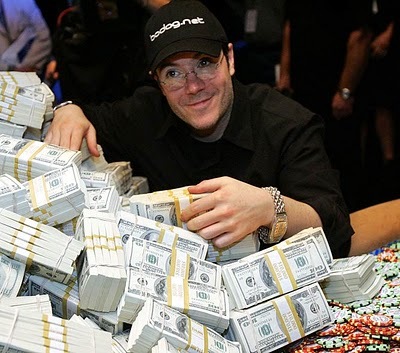 Jamie Gold, 43, won the World Series of Poker Main Event in 2006 and took home an incredible $12 million! 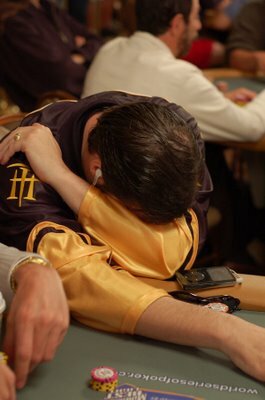 The 2006 Main Event was played during the height of poker's popularity and Gold outlasted 8,722 other players (the biggest main event in WSOP history). A few days ago, The Heritage Auctions wrote that Jamie Gold's gold bracelet from the epic win will be up for grabs at an auction in Rosemont, Illinois, August 1-2, 2013. The bracelet is described on the site as having "259 stones including over seven carats of diamonds and 120 grams of white and yellow gold. Rubies are inset to create the red of the heart and diamond suits, while a sapphire represents the spade and three black diamonds the clubs." Neither Gold nor Heritage Auctions have commented on why the bracelet is for sale, but many believe it's another of Gold's ideas to raise money for charity. Posted on Tuesday, March 26, 2013 by "T". The MicroMillions online series is getting more and more popular every year. The fourth edition of MicroMillions, which concluded last Sunday, attracted 1,572,760 players who battled for an incredible $9,588,892.60 prize pool spread over 100 events. In fact, MicroMillions 4 is the most played tournament series in online poker history! 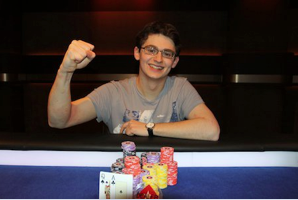 EPT Deauville Main Event: Remi Castaignon Secures A Second French Victory On EPT Season 9! Posted on Monday, February 11, 2013 by "T". Read more » EPT Deauville Main Event: Remi Castaignon Secures A Second French Victory On EPT Season 9! EPT Deauville: 23 Players Fighting for 8 Final Table Seats! The final table is getting closer and closer as only 23 players remain after 4 days of play at the 2013 EPT Deauville Main Event. 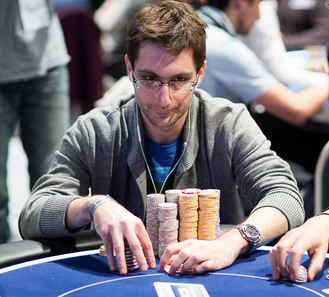 Like all the other days, Day 5 will have a new chip leader: Cyril Andre (picture) from France with 2,108,000 chips! His closest opponent is Remi Castaignon with 1,997,000. The remaining 23 players, all of whom are guaranteed €23,000, will return to the tables in a few hours and play until 8 remain (guaranteed a minimum payday of €60k each). The final table will be played on Saturday and there's a €770,000 first-place prize up for grabs! Day 3 of the Main Event started with 154 players and concluded with 51 after 8 hours of play. Shadaf Hadaya, who's playing his first ever EPT, is the new chip leader with 1,237,000 chips - about 200k more than his closet opponent Matthieu Herve. Matthias De Meulder, Sandra Naujoks, Vanessa Rousso, Fabrice Soulier and Freddy Deeb were all sent packing during Day 3, which means that there aren't any familiar faces left in the tournament. 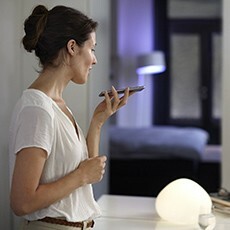 But of course it does not necessary mean that the rest of the tournament will be boring. A first prize of €770,000 is up for grabs and all of the remaining players are guaranteed €13,500. We will be back with another update tomorrow. 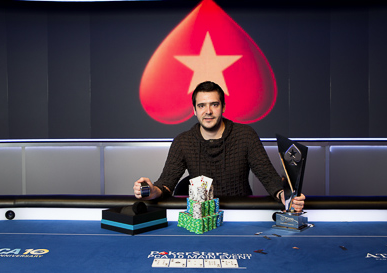 PCA 2013: Dimitar Danchev Wins The Main Event For $1.8 million! Posted on Monday, January 14, 2013 by "T". Dimitar Danchev, 27, who finished second in the 2011 EPT San Remo Main Event, is the newest PokerStars Caribbean Adventure champion! Danchev won his seat in the main event through a $700 qualifier, and after six days of play he had turned his investment into an increadible $1,859,000 (total prize pool $9,573,900 - 987 players). Danchev, who primarily is a cash game player, now has more than $1 million in live tournament winnings and is the biggest tournament winner in Bulgarian poker history. Posted on Tuesday, January 08, 2013 by "T". There's a lot of action at Atlantis Casino Resort in The Bahamas at the moment. Not only was the final table of the Super High Roller ($100k buy-in) played yesterday, but also Day 1A of the Main Event kicked off with 320 participants. 150 survived the day with Maxim Lobzhanidze, from Italy, out in front (248,900). Also heading to Day 2 are Team PokerStars Pros Ville Wahlbeck, Luca Pagano, George Danzer and Joe Cada. Day 1B starts tonight and, according to PokerStars, a gigantic field is expected to show up. Let's hope that they are right about that! We will be back with another brief update tomorrow. Posted on Monday, November 26, 2012 by "T". After 99 amazing events, the MicroMillions III series came to an end yesterday with the $1 million guaranteed Main Event. PokerStars guaranteed that the winner would get at least $150,000, but that number was broken as 61,072 players entered the tournament and created a $1,221,400 prize pool with the winner set to pocket a massive $165,789.31! Not less than 7,920 players received a piece of the prize pool and the final three players agreed to a deal (axel397 120k, numeromis $125k & Senter268 $105k) that left $20k, and the title, to play for. Sonny Sekhon Leads Canada's First Ever WSOP Circuit Main Event Final Table! Posted on Wednesday, November 07, 2012 by "T". A total of 1,032 player signed up for the first ever WSOP Circuit Main Event (The River Rock Main Event) held in Canada - the third largest in WSOP Circuit history and the largest cash buy-in poker tournament ever in Canada. 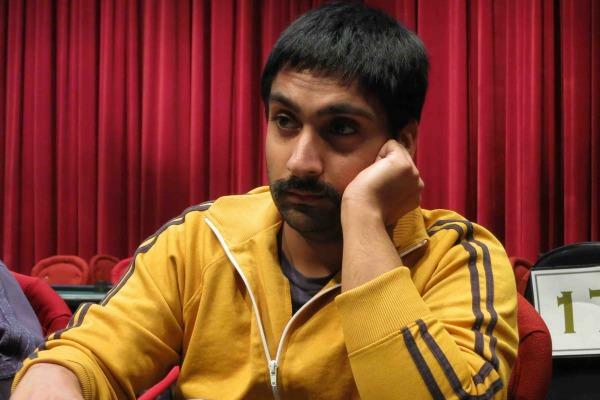 After 3 days of play, the player field had been narrowed down to only 9 players and Day 3 chip leader Sonny Sekhon held 4,660,000 chips, almost 33 percent more than Ryan Biermann in second place. Read more » Sonny Sekhon Leads Canada's First Ever WSOP Circuit Main Event Final Table! 2012 WSOP: Greg Merson Wins The Main Event ($8,531,853)! Posted on Wednesday, October 31, 2012 by "T". It's over. After 13 hours of play and 399 hands, the American poker pro Greg Merson, 24, was crowned the champion of the 43rd Annual World Series of Poker Main Event! Merson sat down at the final table two days ago with the third largest stack. After about seven and a half hours of play, only three players had chips left and Merson had 88.35 million chips - about 26 million more than his closest opponent, Jesse Sylvia. 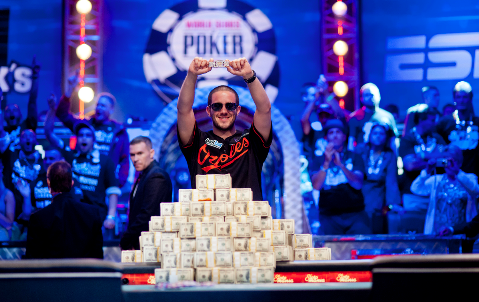 Read more » 2012 WSOP: Greg Merson Wins The Main Event ($8,531,853)! 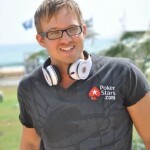 2012 WSOP Main Event: Three Players Remain! Greg Merson Holds The Lead! After about seven and a half hours of play, Day 8 of the 2012 World Series of Poker Main Event and the first night of the final table came to an end. The final 3 players who still have the chance of taking home the $8.5 million first prize and the world champion title are Greg Merson, Jesse Sylvia and Jacob Balsinger - all from the U.S. (the only non-U.S. player, Andras Koroknai, was eliminated in 6th place for $1.6 million). Greg Merson, who was ranked third when the final table kicked off, had an amazing winning streak during Day 8. When Day 9 begins tonight, he will bring a massive 88.35 million stack to the table - about 26 million more than Jesse Sylvia, who had the lead when the final table kicked off yesterday. Balsiger, who eliminated Russel Thomas in 4th place and put an end to Day 8, will bring 46.8 million chips to the final table when play resumes. Day 9 is scheduled to kick off tonight at 5:45 PM local time. Until then, check out the interviews below (taken from WSOP's website). 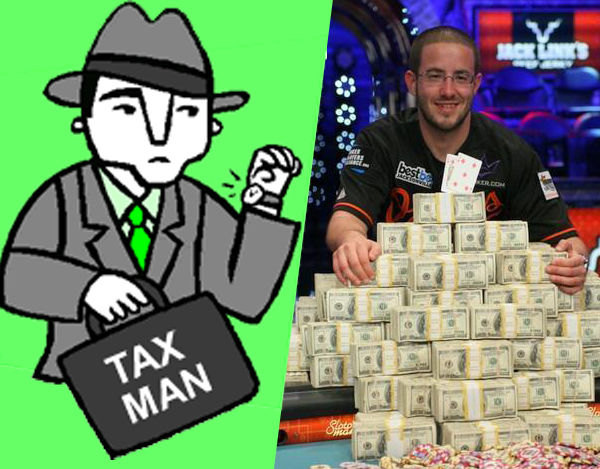 Read more » 2012 WSOP Main Event: Three Players Remain! Greg Merson Holds The Lead! 2012 WSOP Main Event: The Final Table Kicks Off Today! The 2012 World Series of Poker Main Event started on July 7, 2012 with 6,598 players each putting up $10,000 to create a $62,031,385 prize pool. Today, after about a 3 month break, the final nine players ("The October Nine") will meet again at the Rio in Las Vegas and fight for the remaining $27,285,025 in prize money and, of course, the world champion title! 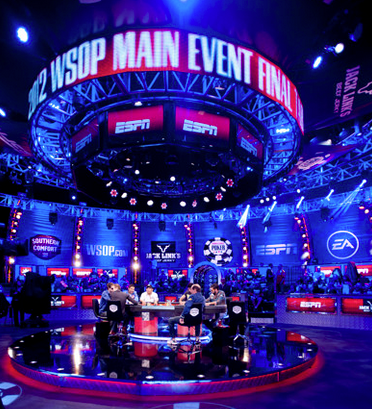 Read more » 2012 WSOP Main Event: The Final Table Kicks Off Today! 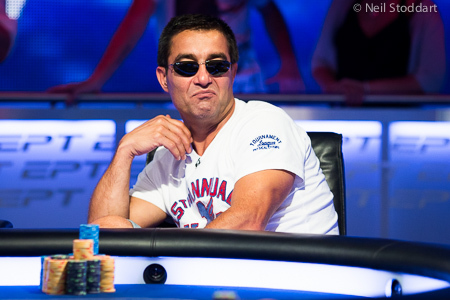 EPT Sanremo: Two-Way Deal On The Main Event Final Table! 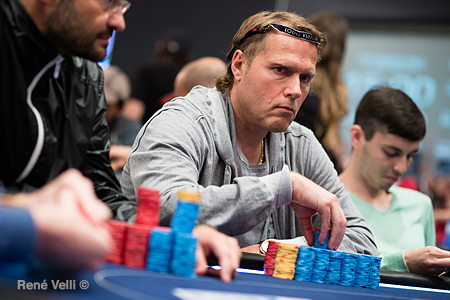 Read more » EPT Sanremo: Two-Way Deal On The Main Event Final Table! 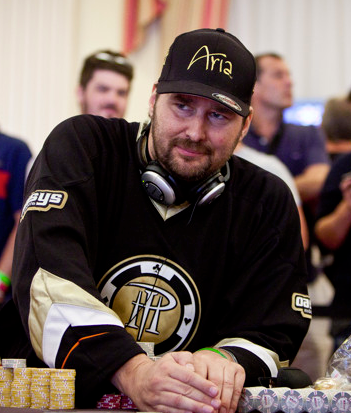 WSOP Europe Main Event: Phil Hellmuth Wins 13th Bracelet! Posted on Friday, October 05, 2012 by "T". A big congratulations to Phil 'The Poker Brat' Hellmuth who outlasted a field of 420 players in the 2012 WSOPE Main Event in Cannes, France! This was the poker legend's bracelet victory number 13, and it occurred only three months after his 12th win at the WSOP (Event #18: $2,500 Seven Card Razz)! Read more » WSOP Europe Main Event: Phil Hellmuth Wins 13th Bracelet! WSOPE Main Event: The Final Table Is Set! Phil Hellmuth Has The Lead! Posted on Thursday, October 04, 2012 by "T". Today the WSOP Europe Main Event final table will be played, and guess what? It will be one of the best final tables in a very long time! Phil Hellmuth has the lead with 3,434,000 chips and the chance of winning his 13th gold bracelet! Joseph Cheong (1,966,000 chips - ranked 3), the third-place finisher in the WSOP Main Event in 2010, is looking for his first gold bracelet victory! Jason Mercier (652,000 chips - ranked 7), the man who's widely considered one of the world's best tournament players, is on the hunt for a third gold bracelet. Below is a brief introduction of the 8 finalists who will be fighting for a first place prize of €1,022,376! 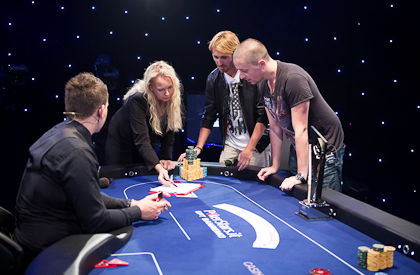 Read more » WSOPE Main Event: The Final Table Is Set! Phil Hellmuth Has The Lead! 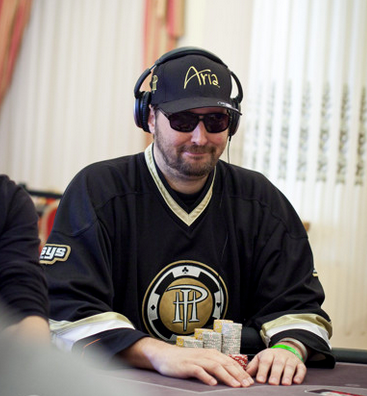 WSOPE Main Event LIVE: 11 Players Left - Phil Hellmuth's In The Lead! Posted on Wednesday, October 03, 2012 by "T". The final table is very, very close now. At the moment 11 players have chips left, including Phil Hellmuth who leads the pack with a 2.8 million stack. Another 3 players need to be eliminated before the final table is set and the tournament goes on a break until tomorrow. The remaining 11 players are guaranteed €52,416 each, the 8 finalists will be guaranteed €84,672 each - with the chance of taking home an amazing €1,022,376 first place prize. 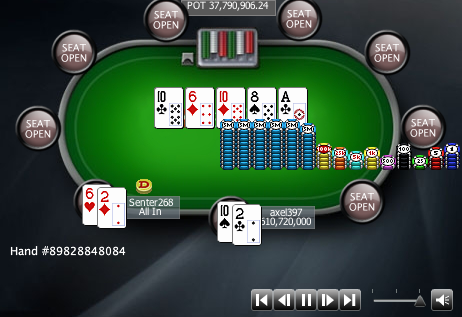 WCOOP 2012: 245 Players Left in the Main Event! Posted on Monday, September 24, 2012 by "T". 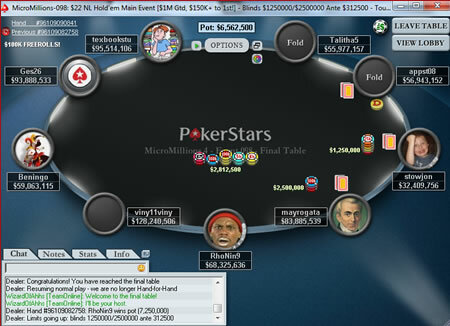 Read more » WCOOP 2012: 245 Players Left in the Main Event! 2012 WSOP Main Event: Day 6 ends with 27 survivors! Canadian Marc Ladouceur leads! Posted on Monday, July 16, 2012 by "T". Day 6 of the 43 Annual World Series of Poker Main Event is now in the books. Erik Hellman from Sweden ended up as the last player to get eliminated (28th place for $236,921) before the tournament crew called it a day. 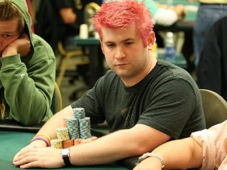 Read more » 2012 WSOP Main Event: Day 6 ends with 27 survivors! Canadian Marc Ladouceur leads! Both Day 1 a and b have now come to an end with approximately 900 survivors, who now will get to rest a bit before it's time for Day 3 to start. Among the survivors you'll find notable players such David Diaz, Eugene Katchalov, Maria Ho, Gavin Smith, Katie Dozier, Bernard Lee, Amnon Filippi, Dani Stern, Mike McDonald, Taylor Paur, Sammy Farha, Brock Parker, Jackie Glazier, David Pham, Gabe Kaplan, Kevin Pollak, Brian Hastings, Eric Baldwin and Faraz Jaka to name a few. Posted on Monday, July 09, 2012 by "M". The 2012 WSOP has finally reached the main event. The 10 day event kicked off on Saturday the 7th of July with the first of three starting days and attracted 1,066 players, which according to WSOP.com "was a 19% increase from last year’s opening session". The main event has a buy-in of $10,000 and after the first day's session only 657 players remained. 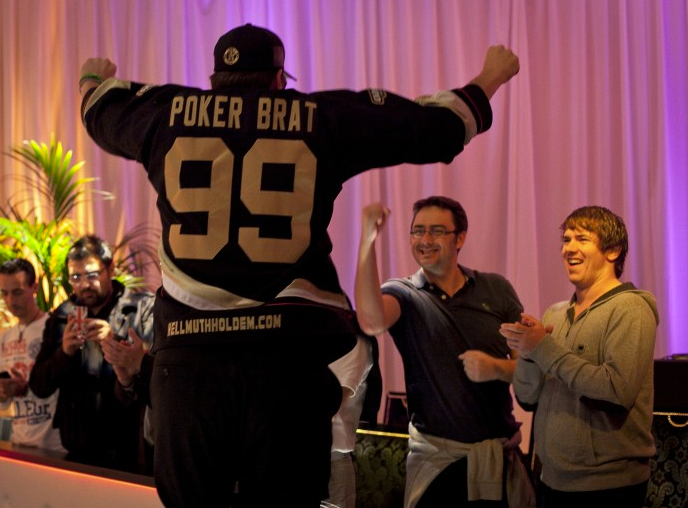 Among the known players that were kicked out during the first day of event 1A were the 12-time gold bracelet winner Phil Hellmuth, the 1993 champion Jim Bechtel and Joe Hachem who got his only bracelet after winning the 2005 main event. The 2012 Spring Championship of Online Poker is now over as 2 days of Main Event action, low, medium and high, are over. The Main Even Low attracted a field of 22,128 players which generated a prize pool of $2,212,800! 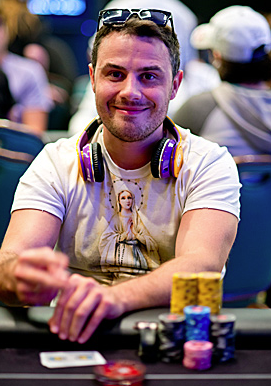 3,150 players received a share of the prize pool and "john_tri80" from Greece took down the event for $198,725,75. Posted on Monday, January 30, 2012 by "T". The 2012 Aussie Millions Main Event came to an end this weekend after only 7 hours of play on the final table. 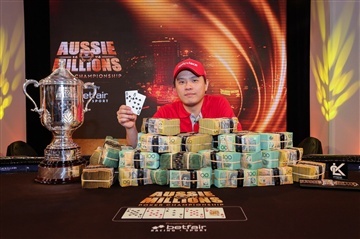 It was the Melbourne local Oliver Speidel who took home the tournament for $1,600,000. A well deserved win for a man who survived a field of 659 players. Posted on Friday, January 27, 2012 by "T". There are only 14 players left in the Aussie Millions Main Event. These survivors will be back at 20:15 local time - after a 75-minute dinner break - and continue until only 12 players remain. Then Day 4 will finally come to an end and the players will get some well-needed rest. Chip leader is Bjorn Li with 2,450,000 chips, and close behind him are Daniel Ideama (2,287,000) and Mohamad Kowssarie (2,247,000). 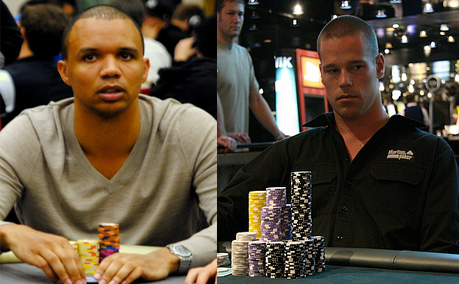 Phil Ivey has lost a lot of chips during Day 4 and now he has 645,000 left - only Matt Turk and Danny Chevalier have less. The next player to hit the rail will get 75,000 AUD, and the 9 players who reach the final table will get at least 125k AUD each. The winner will take home amazing 1,600,000 AUD! Posted on Thursday, January 26, 2012 by "T". A total of 659 players signed up for the Aussie Millions Main Event and created a $6.59 million prize pool of which the winner gets $1.6 million. Today, after 4 days of play, 27 players have chips left and will return at 12:00 pm local time today and play Day 3. Chip leader is Tim O'Shea with 1,370,000 chips, closely followed by Matthew Turk with 1,350,000. 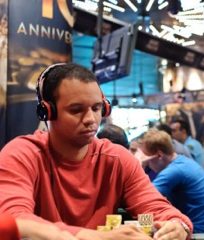 In third place is no one else than Phil Ivey. Yes, that's right! 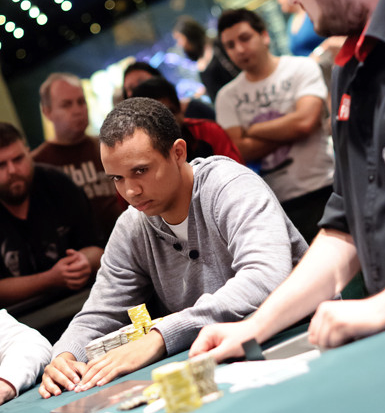 Phil Ivey is no longer only playing high stakes games in Macau. Phil will bring 1,240,000 to the poker tables today. He's defiantly one of the favorites to take home the tournament. Posted on Thursday, July 07, 2011 by "T". We are just hours away from the biggest and most prestige filled tournament in the poker world, the World Series of Poker Main Event! Most of the big names in poker are going to take part this year and we can expect a huge prize pool since the 2011 WSOP has seen many record fields. The Main Event is a 13-day event with 4 starting days. Posted on Tuesday, February 08, 2011 by "T". 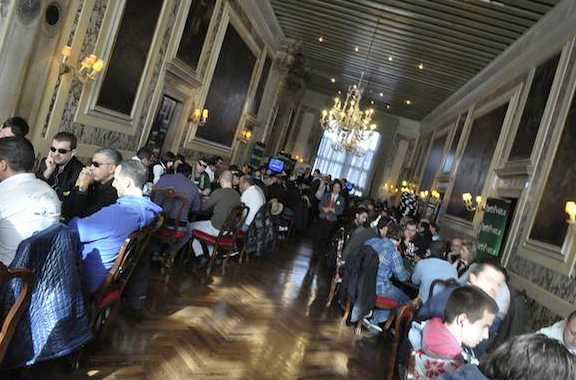 After 4 days of poker, the final table of World Poker Tour Venice is set! 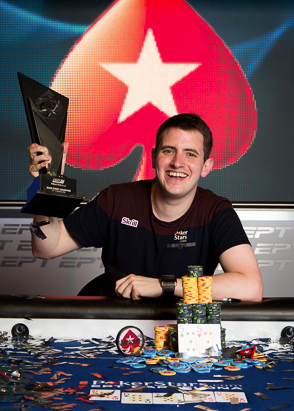 In the lead is no one else than the 2010 EPT London winner, David Vamplew (picture). However, he's not the only EPT winner on the final table. Maxim Lykov, winner of 2009 EPT Kiev, has also made it to the final table with a big stack, however, he's almost 2 million chips behind David Vamplew who has accumulated 4.1 million chips. It will be a very interesting final table where everyone is guaranteed at least €31k each and the winner will get €380k. Posted on Friday, February 04, 2011 by "T". Day 1a of the WPT Venice Main Event is in the books. 218 players signed up for the very first starting day and 101 of them have chips left and will return to play Day 2. The one who will bring the biggest stack from Day 1a to Day 2 is Isaia Alession (212,000), and almost 50k behind him, in second place, Malinov Radoslav Dimitrov with 165,000. Day 1b of the tournament is running at the moment. We will return with an update as soon as the tournament crew calls it a day. Posted on Tuesday, January 25, 2011 by "T". Day 1b of the Aussie Millions Main Event is now in the books. In total 209 players have now made it to day 2. Only 3 Full Tilt Pros survived the day, Scott Montgomery (49,2k) - Chris Ferguson (45,4k) - Roland de Wolfe (26,1k), and will return to play Day 2 of the Main Event tomorrow. Two notable Day 1b survivors in the top of the field were Gavin Griffin (10th place - 101,700 chips) and the chess prodigy Jeff Sarwer (5th place - 120,500). However, the one who accumulated the most chips during the day was Jeff Rossiter - 154,900 chips. The third and last starting day of the Main Event is running at the moment. We will return with an update as soon as the day has come to an end. Posted on Tuesday, November 16, 2010 by "J". The Danish ex-world champion has decided to auction off the trophy from the victory in the WSOP Main Event from 2008 to a good cause - It's still just gathering dust, explains 'Isser'. Posted on Wednesday, November 10, 2010 by "T". After 3 intensive days of tournament poker, the World Series of Poker Circuit Main Event from Biloxi, Mississippi has found its winner. It ended up being Travis Lutes from Cameron Park, CA, United States who took home the tournament and the first place prize of $95,253. It was a very well deserved win and the prize money probably will come useful since he only won $367 before. Posted on Tuesday, November 09, 2010 by "T". Jonathan Duhamel, 23, from Boucherville, Quebec became the first Canadian citizen in history to win a world championship. Two Canadians had previously finished in the runner-up spot in the 41-year-history of world championships. Tuan Lam second place in 2007, and Howard Goldfarb (Jerry Yang won) back in 1995 (Dan Harrington won). 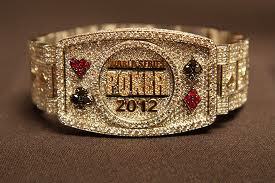 For the win Duhamel received the first place prize of $8,944,31 and his first WSOP bracelet. A big congratulations to the new world champion of poker!